What? I haven’t shared my recipe for Whole Wheat Bread with you? How did I overlook that? I shared on the Grace on Parade blog (see article here)about my competitive bread baking and how the need to practice making bread turned into a ministry of the love loaf, but I failed to give you the recipe. 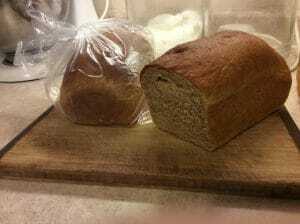 Let me make amends right now and share my recipe for homemade Whole Wheat Bread. You don’t have to be a competitive bread baker to wrap someone with the aroma of homemade bread. Even if it is just your family or guests in your home, homemade bread bears the scent of extra time spent for someone else. Bread recipes are very adaptable. I use dry milk powder because it’s more convenient – I don’t have to heat up milk and dirty an extra dish. Back in the day, milk powder was cheaper than bottled milk. With $.99 specials at some Walmart’s and Aldi’s, that’s not true anymore. You also can use brown sugar or molasses instead of the honey. I prefer honey because it helps preserve the bread longer, but honey is expensive and I don’t always have it on hand so I opt for brown sugar. Here’s my recipe for homemade Whole Wheat Bread. Mix water (105-115) and yeast. Add sugar, salt, margarine, honey, and milk. Stir flours together. Beat in half the flour till smooth and batter falls in sheets from a wooden spoon. Add enough flour to make a soft dough. Knead ten minutes, until smooth. Let rise in warm place till double in bulk, about 1 hour. Punch down, shape into loaves, place in two greased 9x5 pans. Let rise till double, about 30 minutes. Bake at 400 degrees 25-30 minutes. Turn out on wire racks and grease tops. Do you have trouble getting your bread to rise? Make sure your water temperature is 105-115 degrees and all other ingredients are room temperature. When letting the bread rise, I put it in a cold oven and put a pan of steaming water inside the oven too. Your bread will easily rise the first time in one hour and the loaves will rise in about 30 minutes. Take the loaves and your pan of water out of the oven before preheating and allow for that amount of time as well. If you want to use milk instead of milk powder, substitute the same amount of milk for the water. Warm the milk to 105-115 degrees and add your yeast. Omit the dry milk powder. I love adult daughters! When I fractured my foot, my youngest daughter cleared her calendar the week before her fall sesester teaching schedule began and came home for three days to take care of me. Since she was officially in charge of the kitchen, she made me her specialty, Chilaquiles. 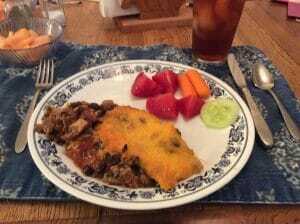 This tasty dish will satisfy both Mexican food aficionados and those hinky about the hot stuff. It’s so adaptable, you can make it as hot or mild as you want. Chilaquiles falls in the category of truly authentic dishes because you make it with what you have on hand and what works for you. It’s a warm comfort food that says, “I care and I want you to feel better.” Christine tells me it freezes quite well too so you can make it ahead for a friend in need. Here’s how you make Chilaquiles. First line a greased pan with corn tortillas. No corn tortillas? Use tortilla chips. 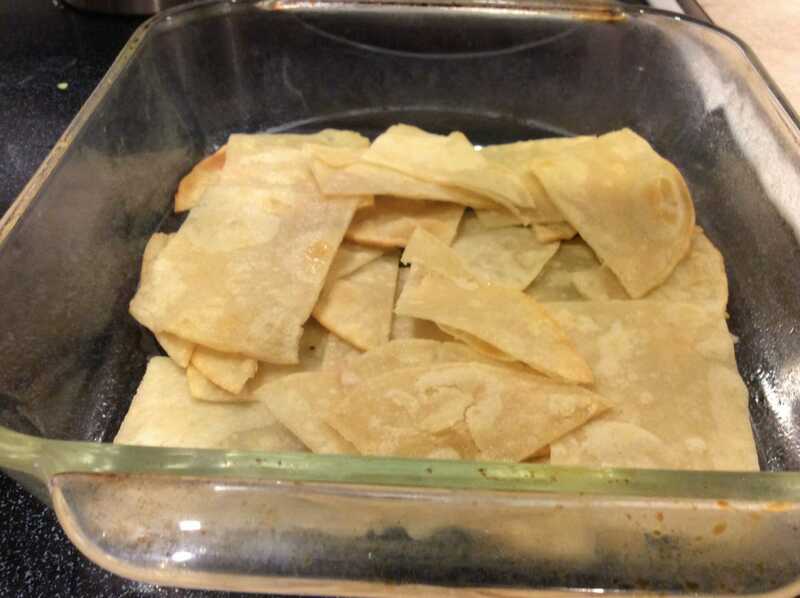 When I made it after I got back on my feet, I lightly fried my tortillas, but you don’t have to. Next, saute hamburger and onion. 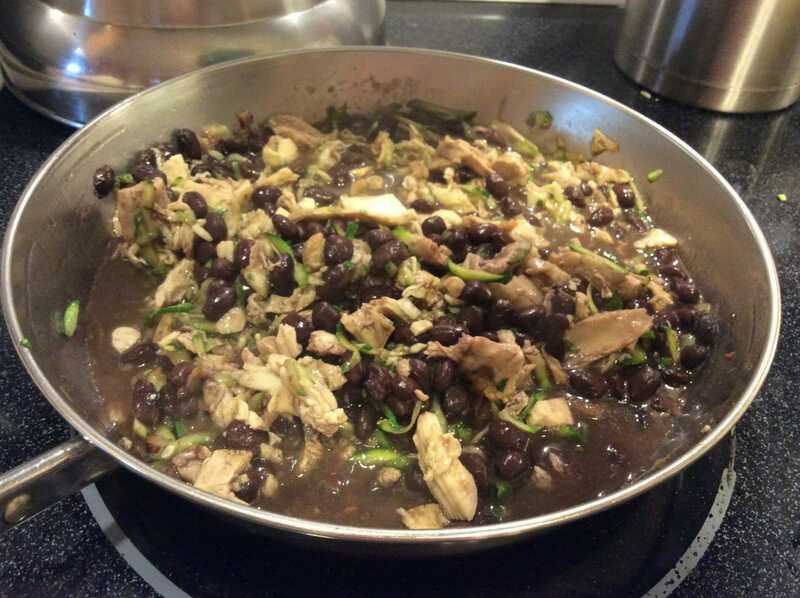 Stir in grated zucchini, spices, and a can of black beans. (What a great way to sneak zucchini past my husband!) The orginal recipe calls for a can of diced tomatoes, a lot more onion, and frozen corn. I opted out. You can also use cooked chicken instead of the hamburger or, for a vegetarian dish, skip the meat all together. 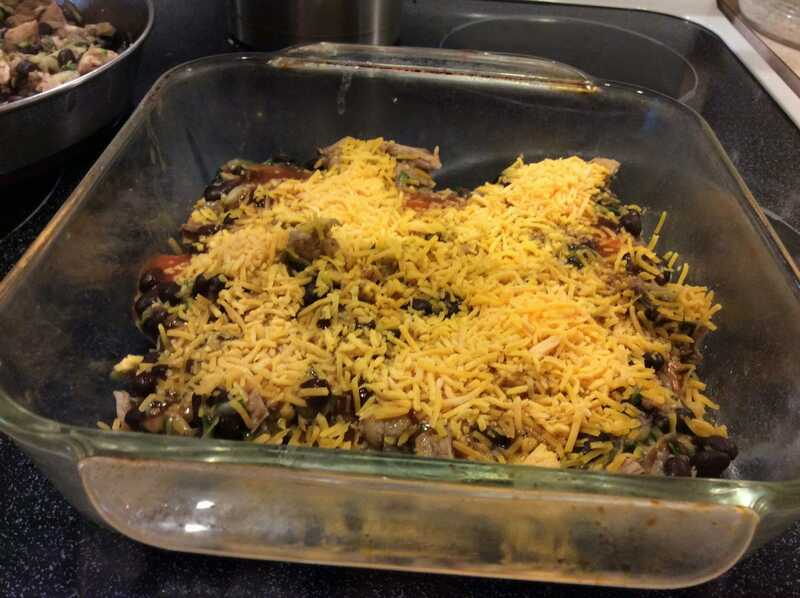 Layer half of the tortillas in your dish, half of the bean mixture on top, half the can of enchilada sauce, then half of the cheese. Repeat the layers. Bake until it’s bubbly and serve with whatever fresh fruit and veggies you have on hand. Doesn’t it look yummy? It’s so good. The best part? Having someone invade my kitchen and make it for me. Christine was one of two sweet people who did that while I recovered. What a gift of grace! Preheat oven to 400°F. Lightly coat a 9x9-inch baking pan with cooking spray.Cook hamburger till no longer pink, then add onion and cook, stirring often, until starting to brown, about 5 minutes. Stir in zucchini, beans, cumin, chili powder, and salt; cook, stirring occasionally, until the vegetables are heated through, about 3 minutes. 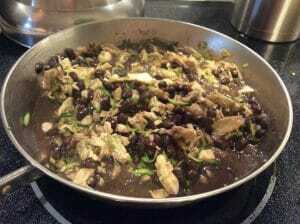 Scatter half the tortilla pieces in the pan. 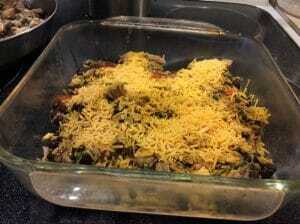 Top with half the vegetable mixture, half the enchilada sauce and half the cheese. Repeat with one more layer of tortillas, vegetables, sauce and cheese. Cover with foil. 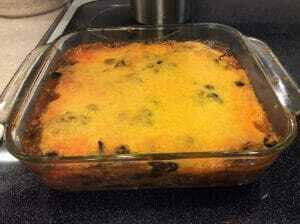 Bake the casserole for 15 minutes. Remove the foil and continue baking until the casserole is bubbling around the edges and the cheese is melted, about 10 minutes more. 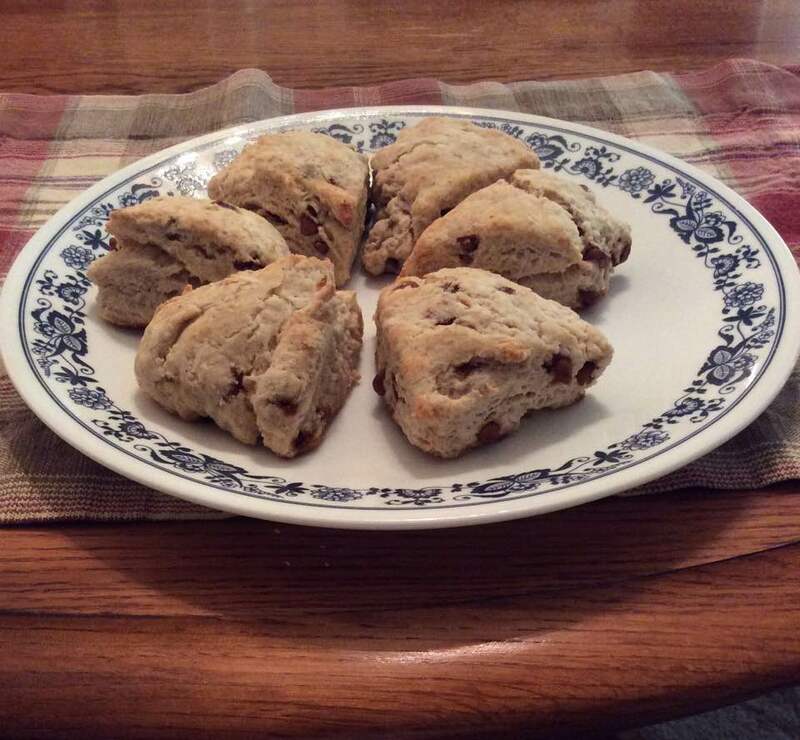 These scones make the perfect treat for a ladies’ bible study, tea with a friend, gift for someone having a down day, or a special Saturday morning breakfast. 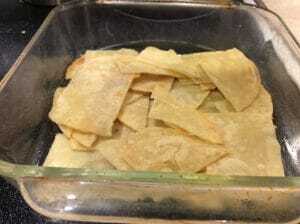 In a bowl, thoroughly stir together the flour, sugar, baking powder, and salt. Cut in the butter till the mixture resembles coarse crumbs. Stir in the cinnamon chips. Beat the egg and milk together in a separate bowl; add to dry ingredients, stirring just till the dough clings together. Knead dough gently on lightly floured surface, 12-15 strokes until smooth. Divide dough in half. Shape into ball and pat into a 6 inch circle, about ½ inch thick. With a sharp knife, cut each circle into six wedges. Place wedges on ungreased baking sheet (do not have sides of wedges touching). Bake at 425 degrees till golden brown, 12 to 15 minutes.